An important component of tackling the opioid epidemic is closing the loop that traps far too many: substance misuse, incarceration and then release without the support to avoid falling back into the same cycle. 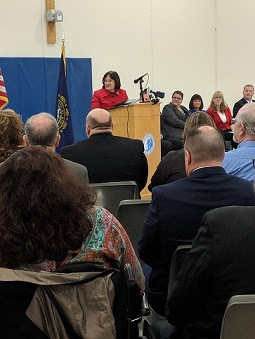 That’s why I was pleased to join state and local officials and members of New Hampshire law enforcement last week for the opening of the NH Correctional Facility for Women in Concord. The facility will offer treatment for substance abuse and mental health issues, expanded educational opportunities, and job training. I’m excited to see these updates, and I know that by providing support and recovery services to women struggling with substance use disorder, we can greatly increase their chances of overcoming addiction and bettering their lives, the lives of their families, and their communities. Addressing the opioid crisis is also going to take investments from the federal government. That’s why U.S. Senators Jeanne Shaheen and Maggie Hassan, and Congresswoman Carol Shea-Porter and I sent a letter to the Health and Human Services (HHS) Department and the Substance Abuse and Mental Health Services Administration (SAMHSA) calling on the Trump administration to make sure New Hampshire gets its fair share of new opioid funding recently appropriated. We urge President Trump to work with us to ensure that New Hampshire receives the resources necessary to support first responders, treatment providers and law enforcement efforts. As a member of the Veterans’ Affairs Committee, my top priority is ensuring that Granite State veterans are able to access the care and support they deserve. I am pleased that the State Veterans Home Adult Day Health Care Improvement Act has been signed into law. This legislation, which I co-sponsored, allows veterans to receive the care they need in the comfort of their own homes, bringing peace of mind to both veterans and their families. This law is common sense, and I will continue to advocate for policies that improve access to care at both the VA and in communities for veterans across the Granite State and around the country. Please don’t hesitate to contact my Concord office at603-226-1002 or my Washington, DC office at 202-225-5206 if you have any questions, concerns or ideas you wish to share with me. Thank you for everything you do to make our state such a wonderful place to call home, and I hope you have a great week!